We are glad to offer to you year-round accommodation during your vacation in the mild climate of Gelendzhik resort. The town is situated in Krasnodar Territory, 25 km from Novorossiysk, on the coast of Gelendzhik Bay of the Black Sea. Gelendzhik climate is subtropical dry. Mean annual temperature is +13.5 °С. The winter is mild. Due to mild winter Gelendzhik occasionally becomes a wintering ground for several species of aquatic birds, including swans. The summer is warm. The season favorable for vacation lasts from June to September (minimum of precipitations). The swimming season is from May to October (sea water temperature +18... +25 °С). Gelendzhik Bay divides the town into two capes: Tonkiy (Thin) (northern) and Tolstiy (Thick) (southern). A new airport is located on Tonkiy cape. Tolstiy cape has a sea port, a lighthouse, 2 bus terminals, it is the main part of the town. We are offering you a non-expensive sea recreation in the private sector. The house is situated on Tolstiy cape, far from the noise of quay and high-traffic highways. The distance to the sea is 1,800 m. Just behind the house there is a large pine forest consisting primarily of Crimean and Pitsunda pines. Paths through the woods also take you to the sea and the magnificence of bluff shores. The distance to the sea through the forest is the same, 1,800 m. The house rises at eighty meters over the sea level, and one can admire the townscape from its balconies and windows. The windows on the top floor spread out before one’s eyes a wide, green, evergreen carpet. See house location on map on the right. Most often people come here for vacation on private vehicles. This gives an opportunity to see sights of the entire coast of Gelendzhik district, to swim in clear water of the open sea, on less crowded beaches, to immerse yourself into the feelings of hairpin turns of the narrow mountain roads. Click on the picture to enlarge it in a new window. 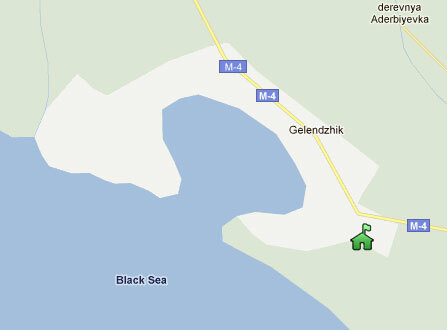 Transfer from the airport and bus terminal of Gelendzhik is free of charge. from the airport or railway station of Krasnodar 90 dollars. For people traveling on private vehicles there is a parking lot, covered tent, and a garage. Accommodation rate per night, per person, dollars. Note: accommodation rate for child under 12 years old is half of adult accommodation rate. Note: the house is equipped with automatic water storage, supply and heating system, which allows round-the-clock use of cold and hot water. № 2 double: 1 double bed, bureau, wardrobe, refrigerator, microwave and TV in the hall, shower (hot and cold water) with toilet shared with №4 on the floor. №3 triple: 3 separate beds with bedside tables, wardrobe, kitchen (gas stove, refrigerator, table, microwave and TV), bathroom (hot and cold water) with toilet, and a terrace (table and sofa) shared with №4. №4 triple: 3 separate beds with bedside tables, wardrobe, kitchen (gas stove, refrigerator, table, microwave and TV), bathroom (hot and cold water) with toilet and a terrace (table and sofa) shared with №3. №5 triple: 3 separate beds with bedside tables, wardrobe, refrigerator, microwave and TV in the hall, shower (hot and cold water) and toilet shared with №6. №6 double: 1 double bed, bureau, wardrobe, refrigerator, microwave and TV in the hall, shower (hot and cold water) with toilet shared with №5 on the floor. Have a good time by the sea!